I’ve gotten a lot of questions on the artwork that Chloe & I made for their re-designed bathroom. It was a pretty easy project and took us an hour or so. 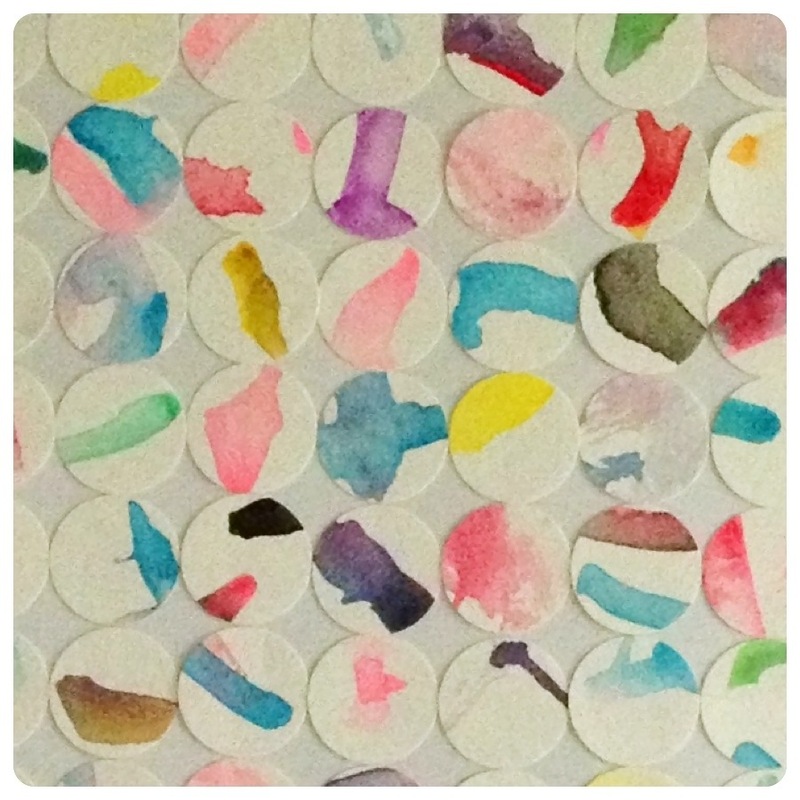 I had originally seen the “Children’s Artwork Collage” on Playful Learning. She did this project with an older child, but we followed her lead for the most part. We used generic kid’s watercolor paints that came along with a licensed Disney Princess watercolor book — nothing fancy. 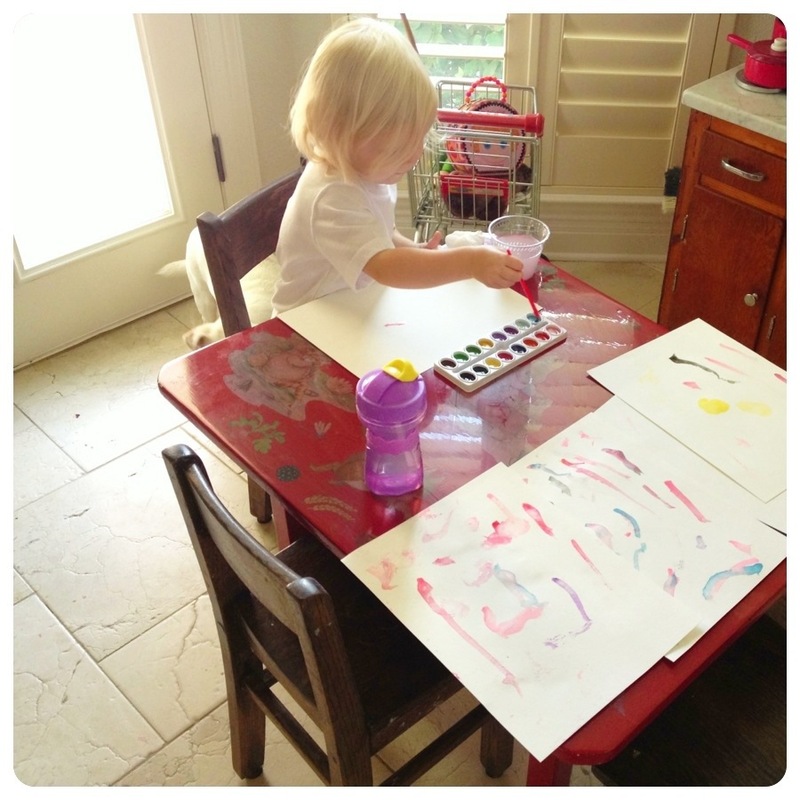 Chloe painted the watercolors onto watercolor paper. We got the 20-pages for 99₵ special at Michael’s (plus a 20% off iPhone coupon, score!). I let her loose and when she announced “all done”, I handed her another page. She kept at it until we had 6 or 7 pages and let them dry for a bit. 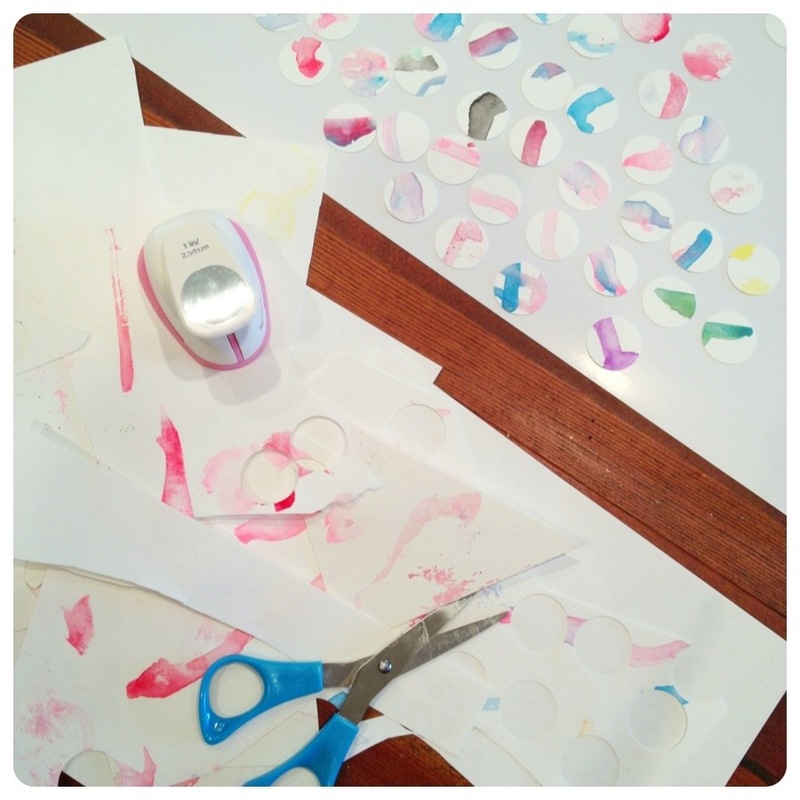 The original project used index cards to make for easy punching since the child was doing the punching. Chloe is not able to operate the punch, a 1″ circle punch (also from Michael’s and available at most craft stores), so I did this part. Since much of the watercolor was not near the edges, I cut away blank parts of the paper to get to the painted parts. I then had Chloe help me mix the pile up. She thought that part was particularly fun. I didn’t want an entire section of pink, then a section of blue, etc. For the background, we used the paper that came with the frame turned over. The design was nearly solid blue and could be seen faintly through the paper which worked as a great guide as to where to put the punched-out water color circles. I laid out a row and column to get an idea of spacing, then used generic craft paste to attach the circles to the back of the frame filler. I thought that I would need to make a grid somehow, but really it wasn’t necessary. In the original project, she measured out the outline as a boundary. Then we framed it up and hung it up in the girls’ bathroom! We make this a special Chloe/Mama project because Cora doesn’t really get the watercolor concept yet (it’s a new activity at our house) and it bothers Chloe that she doesn’t do it “right” (as in, painting herself). She’s also not as big a fan of art projects as Chloe in general. I love how it turned out and can’t wait to do future kid art into home decor projects!